Stirling Engine Failure. Now Successful!! 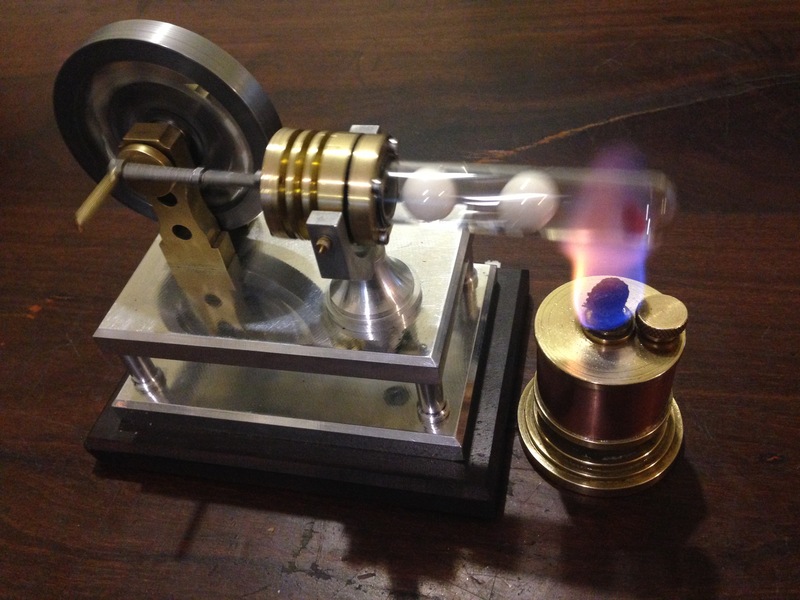 The Ridders “Bobber” Stirling engine which I made in 2014, and which defied all attempts to make it work, is now functioning beautifully! After I completed the Koffiekop engine, and saw it working, I realised that I had not been adequately particular with some of the machining aspects of the Bobber. So I took the Bobber off the shelf, took it apart, and remachined the bore, made a new piston, and a new connecting rod bush. Then I polished the bore using Gumption (see old post about Gumption) on a wooden dowel which was turned precisely to the correct diameter. I was not concerned about some splits in the wood, as they acted as reservoirs for the Gumption. After cleaning out the Gumption residue the bore was ultra smooth and shiny. The piston slid easily on its own (miniscule) weight, and the sliding ceased when the top end was blocked with a finger tip. I experimented with fuels (olive oil too much carbon deposition, but methylated spirits fine), number of ceramic ball bearings (three specified in the plans, but two seemed to work better), and most importantly, and serendipitously (that one’s for you John), reversed the direction of the flywheel. See the video below for the result. Photo of the operating Bobber engine. The white balls are ceramic bearings. The piston is now made of graphite rather than the original steel, and I was particularly particular about the polish of the cylinder bore and the fit of the piston. Video of the operating Bobber engine. Such a cute little engine!